I've never been a big fan of the Navigation Pane in GP9 and prior versions. I just don't like anything taking up my precious desktop space. However, I've found a great use for it. If you've used Great Plains for 5 minutes you've figured out how to export a Smartlist to Excel. Great feature, simple interface, push the button. But... there is another dimension to Smartlists and Excel that we're going to explore. With a Smartlist open, pick Extras->Smartlist->Export Solutions to see what I'm talking about. Smartlist allows you to export to the SAME Excel spreadsheet time after time. You can also specify Excel macros to run before and/or after the export for formatting, analysis, etc. If you’re using SmartLists on a regular basis to report on information in Dynamics GP, you’ll want to learn how to use the Export Solutions functionality within SmartLists to add charts, pivot tables, calculated fields, and additional formatting to your data. 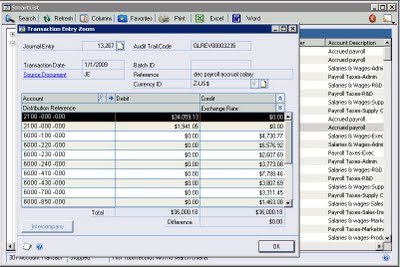 Export Solutions allows you to run an Excel spreadsheet macro on the data that SmartLists exports to Excel. One characteristic of SmartList that can be frustrating is the way the SmartList window shrinks when you drill into another window from a SmartList record. When you close the sub-window, the SmartList window remains at its reduced size and you have to click the "Maximize' button to maximize the window size again. A client of mine was gracious enough to do some testing with this switch and discovered a couple of notable issues. Ok, so why the journalistic type nature of this article? Well, if like many users out there you tend to export tens of thousands of records out of Microsoft Dynamics GP using SmartList and you complain about the export's performance, then I guarantee you will want to read Patrick Roth's new article Smartlist: Exports slowly to Excel - Part 1. I recently received an inquiry from a friend at BlueLock. BlueLock provides infrastructure hosting as a service. Don't want to deal with servers? Need to have a virtual infrastructure that allows offices in Tokyo, Paris, Moscow, London, and New York to all easily access your Dynamics GP system? That's what they do--all very fancy cutting edge hosting and virtualization, with enterprise grade Citrix and VMWare hosting.